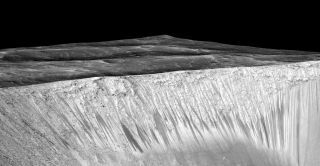 Are Mars' Dark Streaks Really Evidence of Liquid Water? Dark streaks called recurring slope lineae (RSL) emanate from the walls of Mars’ Garni Crater in this image by NASA’s Mars Reconnaissance Orbiter. These RSL are up to a few hundred meters in length. SAN FRANCISCO — The intriguing story of Mars' mysterious dark streaks may have a new twist. The streaks, known as recurring slope lineae (RSL), occur seasonally on steep, relatively warm slopes at many locations on the Red Planet. They were discovered in 2011 by scientists studying images captured by NASA's Mars Reconnaissance Orbiter (MRO). The hydrated-salts discovery generated a lot of excitement, because it suggested that some places on the otherwise dry Red Planet's surface may be capable of supporting life as we know it today. The presence of available liquid water — even salty water, as the stuff within the RSLs would likely be — could also aid efforts to send astronauts to Mars, NASA officials have said. But it may be prudent to rein in that excitement a bit, according to a new study. Hydrated salts are crystalline solids, and it's possible that the water the RSL salts contain comes from the Martian atmosphere rather than liquid water at or near the surface, said Raina Gough, a research scientist at the University of Colorado, Boulder. These results, which Gough presented Tuesday (Dec. 13) here at the annual fall meeting of the American Geophysical Union (AGU), don't prove anything; it's still very possible that liquid water is involved in the formation of the hydrated salts within the RSL across Mars, Gough stressed. But that exciting scenario shouldn't be taken as a given, she added. "Hydrated salts are not always evidence of liquid water," Gough told Space.com at the AGU meeting. Future lab work should attempt to determine which salts cannot be hydrated via atmospheric water alone, Gough and Tolbert wrote in the new study. Such salts, if identified on Mars, would provide very strong evidence for the presence of liquid water, they added.